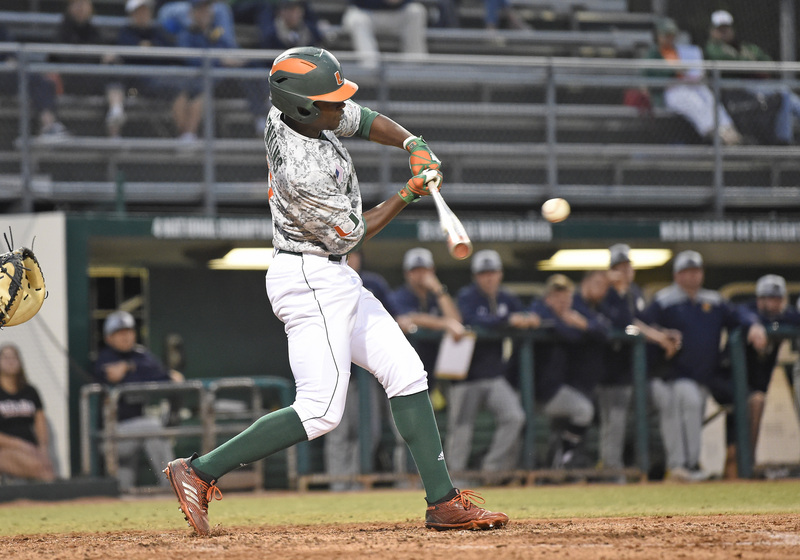 Coral Gables, FL – The University of Miami Hurricanes dropped a heartbreaker in extras, losing 9-5 in the second game of Saturday’s doubleheader at The Light. Greg Veliz (0-1 2.92 ERA) toed the rubber in the final game of the series, facing fellow righty Cameron Junker (0-1 6.52 ERA). Both pitchers received a no-decision, continuing the search for their first W of the year. The Canes got on the board in the first as right fielder Hunter Tackett, already having a great series with Friday night’s awesome catch out in right field, smacked an RBI single to left, scoring speedster Tony Jenkins from second to put the Canes up early. However, the Fighting Irish scored their first run of the weekend series at the top of the second as third baseman Jared Miller singled right up the middle, scoring a run. That’s one run in 20 innings, not the worst drought in recorded history but still pretty bad. It sadly won’t be their last run of the game. The Fighting Irish put on their boxing gloves and scored again in the third, this time with a two-run dinger over the left field fence thanks to Nick Podkul. It was his first of the year. Notre Dame would tack another run in the fourth with a sac fly giving them a three-run lead. 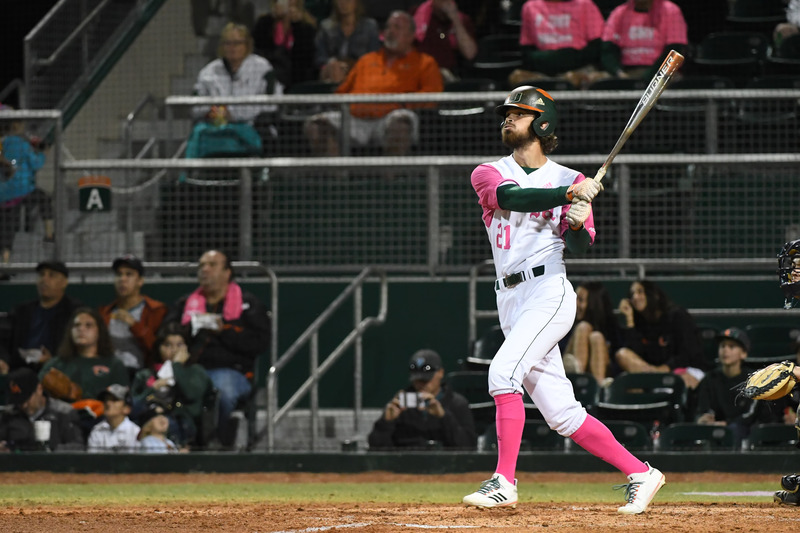 Knowing their first sweep of the season was on the line, Miami stormed back with a four-run fourth. After Cole Kmet took over for Junker, Canes catcher Isaac Quinones greeted him with a single into right-center to lead things off. Willy Escala went up to bat and laid down a nice bunt that should’ve been a routine out at first to move up the runner. Fortunately for the Hurricanes, the ball streaked past the first basemen, ricocheting off the fence and bouncing deeper into foul territory in left. When everything was said and done, Quinones was sitting pretty at third with Escala making himself at home at second base. A pop-up by Alex Toral scored Quinones, followed up quickly by Jenkins who got on base on a fielders choice, bringing in Escala to make it a one-run game. Miami catcher Isaac Quinones (31) celebrates his score during the game. The Canes kept up the pressure as redshirt senior Michael Burns crushed a double to left center, tying the game. He would later steal third. Second baseman Freddy Zamora brought him home with a grounder to short, completing a terrific rally to put the team back on top, 5-4. The Canes came close to adding more to their lead the following inning but were turned away by Miller for the 5-4-3 double play. Notre Dame threatened again in the sixth, this time with Daniel Federman the mound. After striking out right fielder Eric Gilgenbach, Federman gave up a single and then a double. With both runners in scoring position, Federman settled down and retired the next two batters to get out of the inning. Then the baseball gods intervened. A bouncer up the middle seemingly dances off both new reliever, junior Andrew Cabezas, and the second basemen as it slow-rolled into center, allowing rival shortstop and lead-off man Cole Daily to make it all the way to second. A clean sac bunt would move him to third, eventually scoring on a Matt Vierling laser that bounced off Cabezas’ glove towards Zamora at short, tying the game. 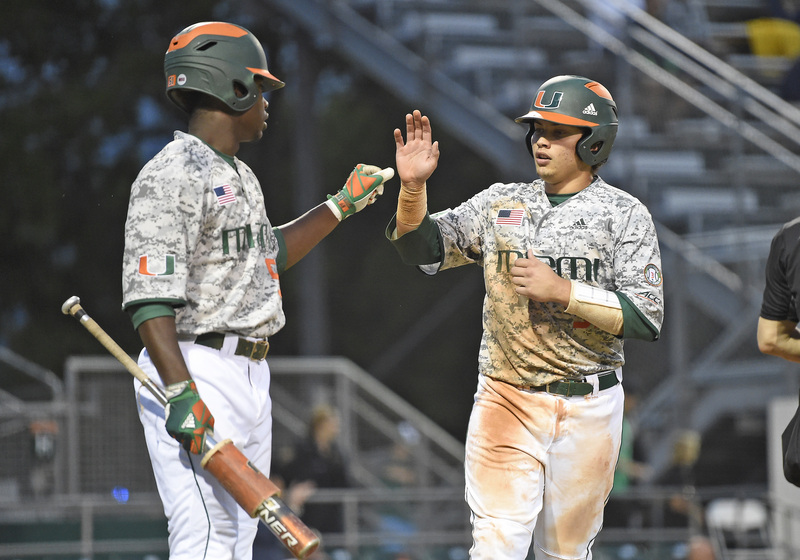 Miami came to within mere inches of walking away with the win at the bottom of the ninth. With two outs and Zamora on second, Tackett hit a liner to right. Zamora raced with all his might, rounding third and heading for home but Gilgenbach fired a laser to the catcher, gunning down the freshman at the plate taking the game to extras. While painful, what came next was more so. At the top of the tenth Notre Dame finally broke through with a bases-loaded, two-out double to left by pinch-hitter Alex Kerschner. It got worse as two more runs scored with a blooper to left going over both Zamora and Raymond Gil. It signaled the end of Cooper Hammond’s brief stint (3 batters faced) on the mound, who replaced Cabezas. Ball game. The Hurricanes won the first game of the doubleheader, crushing the Fighting Irish 9-0 as Evan McKendry (3-1) tossed another gem whiffing a career-high 12 batters while giving up just two hits in six innings of work. The team also won on Friday (Breast Cancer Awareness Night) 3-0, thanks to senior Jeb Bargfeldt (2-1) who went 7 and 2/3rds, giving up only 5 hits in the shutout. In honor of our annual Breast Cancer Awareness night, we will be wearing these pink uniforms tonight. With the loss, the team falls back to 7-8 (2-1 Conf.) missing out on another series sweep. Hunter Tackett had a fantastic weekend going 6-for-11 (.545), adding 4 RBIs to his total. We also can’t forget his awesome catch on Friday, worthy of SportsCenter top 10 mention. (I think so). Canes Outfielder Hunter Tackett had himself a weekend. Willy Escala went 2-for-3 Friday and Saturday (Game 1 of DH), getting 2 RBIs including his first home run of the season in the latter. He ended Game 3, 1-for-4 with a run. Isaac Quinones finished the game 2-for-4, continuing his great service in the absence of the injured Michael Amditis. Starting pitcher Greg Veliz pitched 4 innings, giving up 4 runs (2 of them earned) on 3 hits and 8 strikeouts. Reliever Alex Cabezas lasted 3 and 2/3rds giving up 4 runs (3 earned) on one hit. A total of 5 errors were committed in the series finale, 3 by Miami. Miami hits the road for four games, starting with a mid-week matchup with UCF followed by Duke next weekend continuing ACC conference play. With the conclusion of the 3 game set, the Hurricanes now have a 19-6 all-time series lead against the Fighting Irish including a 14-5 lead at home. Freshman Chris McMahon (Meniscus) is expected to return in late March while junior Danny Reyes is recovering from a torn ligament in his thumb. He is going to miss approximately 5-6 weeks. Redshirt freshman Michael Amditis is also out with a bone bruise, he is expected to miss 2-3 weeks.